Playful in its own artistic expression and experimentation, Toy Story celebrates the free rein of play. All types of play surge through the film: creative play, play-acting, devious play, artistic play. Play remains one of the film’s core themes and values. For the main characters, getting played with amounts to their raison d’etre. In turn, to inspire their artistic work, the film’s artists revisited their own childhoods, recalling the inventive and sometimes twisted play they themselves engaged in as kids (Kemper 2015: 7-8). 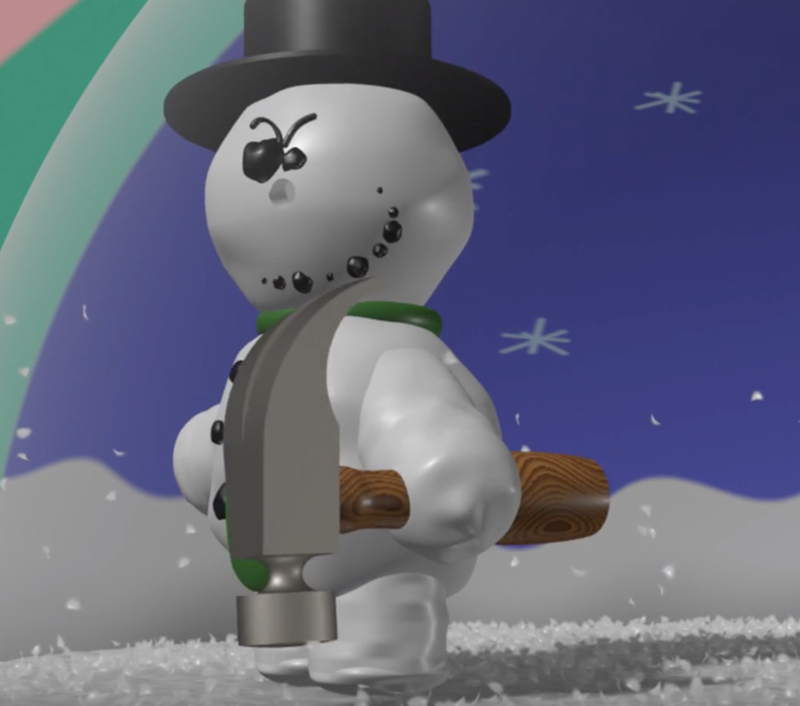 Kemper then goes on to show how the artistic design of Toy Story drew heavily from the Pop Art movement, especially in the creation of the world that the toys inhabit. His description of the Dinoco gas station and logo highlights the strong lines, smooth surfaces and deep shadows that the computer can create (see fig. 1). As Kemper points out, the commercialized Pop Art design and colors of the gas station juxtaposes nicely with the commercialized design of one of the film’s main characters, Buzz Lightyear. 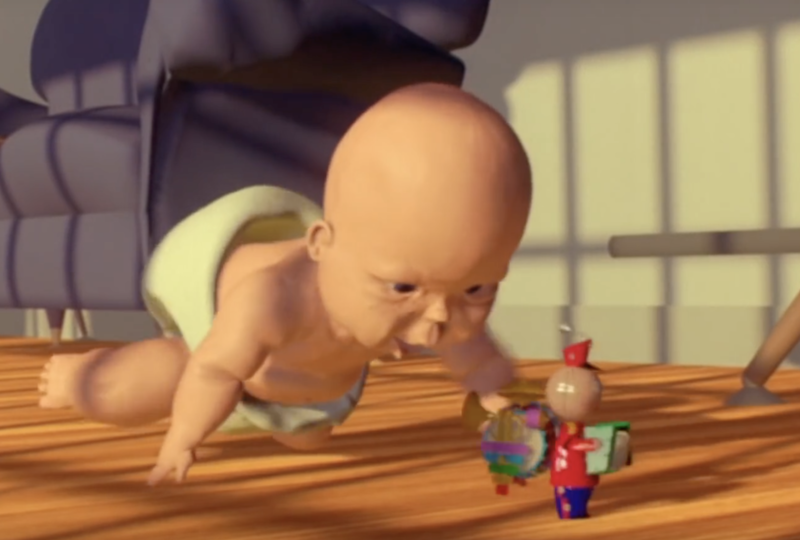 The fact that Buzz spends most of the film refusing to believe that he is a toy further brings attention to the fact that modern play is built upon mass produced, disposable objects designed to foster a consumer culture. Interestingly enough, and a fact missed by Kemper, Disney did not anticipate all of the toys that fans would clamor for after the film’s release, specifically the little green aliens, thus missing out on a lucrative tie-in market (see EW STAFF 1995). Fig. 1. Woody and Buzz at Dinoco Gas Station. The choice of toys, while allowing for an exploration of different types of play and nostalgia for play-time, also worked to the advantage of the limitations of computer animation. As Kemper discusses, computers were not able to capture the nuances of skin and textured surfaces. One area where Kemper’s analysis does not seem to fit the correct popular cultural mark is his discussion of Pizza Planet, the pizza parlor/arcade where much of the film’s second act takes place. Kemper equates the restaurant to the diner in the film Pulp Fiction. Yet, children from the 1980s and 1990s, Pixar’s animators included, would perhaps more appropriately see Pizza Planet as a fictionalized version of Chuck E. Cheese, Showtime or Major Magics. In fact, Chuck E. Cheese’s slogan, “where a kid can be a kid,” more appropriately fits Kemper’s theme of play. As Kemper himself points out, the new generation of artists (who mostly trained at CalArts) came from a different cultural background than Disney’s previous animators (see Kemper 2015: 20). In the following section, Kemper explores the early days of Pixar and its relationship to the changing leadership at Disney. Especially enlightening is Kemper’s analysis of how elements from John Lasseter’s earlier short films, Tin Toy (1988) (fig. 2) and Knick Knack (1989) (fig. 3), influenced the look and humor of Toy Story. This period in Disney’s history is also well-detailed by Kemper, including how Jeffrey Katzenberg impacted script development. He writes: “The logic for this change stemmed from Katzenberg’s mandate to solve story problems in screenplay development; hence . . . the film-makers homed in on the strongest elements of the story and removed scenes. . . that strayed from the main arc” (Kemper 2015: 35). While Kemper provides an interesting critical summary of the story and character development, he also offers insight into the challenges that animators faced as they tried to bring the toys to life on-screen. He discusses how these problems were very similar to the ones faced by early animators, such as how to create a sense of depth and scale, as well as how to draw a realistic human figure and face. Disney had to address similar problems as they worked to bring Snow White and the Seven Dwarfs to life in 1937. Overall, Kemper’s critical reading of Toy Story shows how computer animators looked to the past for inspiration while exploring how technology pushes the field into new directions. At the same time, Kemper explores the differences in styles of play as seen in the human characters of Andy and Sid, as well as how family dynamics affect how play occurs, all things that are relatable to anyone who ever had a toy. Pamela C. O’Brien is an Associate Professor and the Chair of the Communication Arts Department at Notre Dame of Maryland University. She has been researching and presenting about animation for over 25 years. She is a critical cultural scholar who studies adult-oriented TV animation, Disney feature-length animation (especially how and why Disney altered classic fairy tales), and the history of TV animation. She also researches social media and co-founded the Social Media Technology Conference and Workshop. Kemper, Tom. (1995). Toy Story: A Critical Reading, London: BFI. EW STAFF (1995). “Where are the ‘Toy Story’ Misfits?” Entertainment Weekly, December 15, https://ew.com/article/1995/12/15/where-are-toy-story-misfits/ [Accessed 10 March 2019]. It’s really great art which software you used to make this character a special child one is that Autodesk?